The other great Argentinian grand prix driver of the 1950s was nicknamed El Cabezon (Fat Head) and The Pampus Bull tells you a lot about Jose Froilan Gonzalez's physique. That he was able to stun Ferrari team leader Alberto Ascari with his speed as he dominated the 1951 British Grand Prix tells you everything you need to know about his ability. 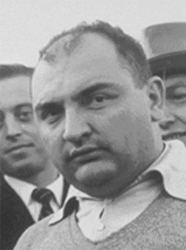 Overshadowed by Juan Manuel Fangio, Gonzalez never contested a full world championship season despite being a Ferrari and Maserati factory driver - easing off his racing activities following the death of compatriot Onofre Marimon at the Nurburgring in 1954 two weeks after winning his second British Grand Prix. He continued to make sporadic appearances until 1960 and he would surely have won more grands prix had he accepted Tony Vandervell's overtures to become a full-time Vanwall driver after his one-off apperance at Silverstone in 1956. Should Jose Froilan Gonzalez be higher or lower in F1's greatest drivers?